MENOMONIE, Wis. – May 28, 2014 – StrandVision Digital Signage today announced that it is adding a new way to source material for its electronic signage customers. It has developed a method to capture Web page content from the Internet and intranets, automatically format it to electronic signage customer settings and merge it into the digital media player presentations. This capability offers many benefits for StrandVision customers. 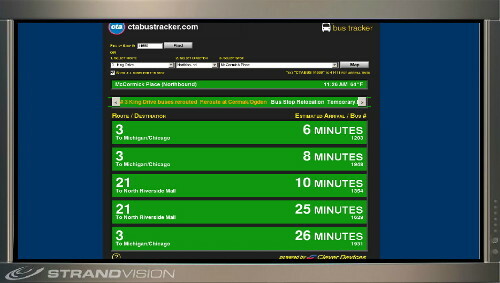 Applications include adding dynamic information that is becoming more widely available over the Web directly into StrandVision Digital Signage such as near-real-time bus schedules and expected arrival times and traffic maps, for display in public areas and for employee communications. The StrandVision cloud-based digital signage service Web Page facility captures Web pages, immediately converts them to images for display on StrandVision's cloud server and distributes them to the local media players as needed. The system pre-loads and captures the Web page so that the content displays immediately rather than waiting for information to be gathered from the source Web site. User-specified delays can be configured to ensure that Web sites are fully loaded in the background before they are captured. The pages are captured and formatted to match the digital media player display orientation. The administrator console can also securely store log-in information so password-protected sites can be included as sources. Administrators can choose to offset portions of the pages to better utilize the screen region resources and highlight certain sections. The new Web Page capability also takes advantage of the capabilities of many corporate and enterprise systems, as well as other specific business applications, which typically can generate Web page output. With this new enhancement, the StrandVision system can take charts, graphs or other details from this standard business system data output and capture it for display on its digital signage player. This opens a world of possibilities for Human Resources, operations, production, finance, safety and other corporate departments. "The enhanced Web Page display is another free digital signage capability that makes StrandVision Digital Signage a more capable, more flexible and more effective business marketing and employee communication tool for our customers," commented Mike Strand, StrandVision founder and CEO. "There are an untold number of applications, including the obvious real-time transportation and traffic reports, and we're looking forward to seeing the creative ways that our signage subscribers use this tool to meet their individual communication needs." The Web Page capability complements StrandVision's previously available streaming weather and radar displays and its local and national new services. It also provides another option to StrandVision's ability to capture and convert RSS feeds and its extensive database-to-digital signage conversion capabilities. The no-cost Web Page add-on capability is available immediately to StrandVision subscribers. It has been added as a new page type in the "Modify Pages" section of their Content Management System (CMS) portal. Web Page refresh rates of less than 15 minutes require a StrandVision Linux digital media player.